My study jam. Now I just need to study LOL. And I will start that by being on WP, when I should absolutely be studying. My room is an absolute mess right now. I’ve got stuff everywhere. If a tornado were to somehow enter my room and just blow everything away, it still wouldn’t look as bad as it does now. Just add a few angry midgets in the mix with some wooden hammers and you’re probably on the right track. Haha, on another note…I should totally have waited on posting these last two awards. At least until after finals week. The amount of traffic recently has totally kept me on here for way too long! But I’m not complaining. It’s amazing to know that when I first started…I figured that I would be the only reader. And now…I couldn’t have possibly have known that this supposedly ‘lame’ first attempt at a blog would’ve gotten to where it is now. But I just wanted to thank everyone out there for the incredible support. 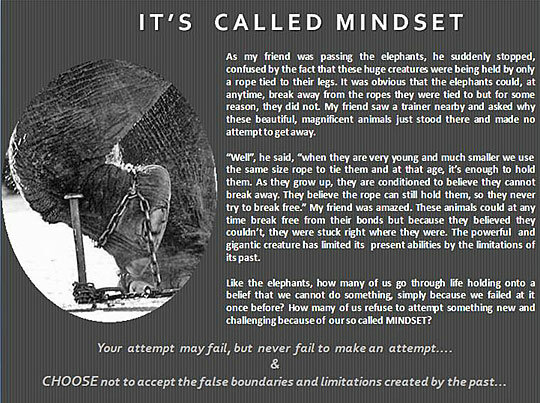 This blog wouldn’t be, if it weren’t for the incredible people that stop by and are kind enough to drop some advice, or wisdom, or even just a hi! Although it’s getting harder to personally thank everyone, it’s still one of the top priorities that I have. I think it means a lot more when you get a personal thanks from that person. I know it totally makes me happier than a kid Christmas morning when some of the more well known blogs reply to something that I’ve said. Even if it may have been only one or two words haha. But it means a lot to know that they go through their comments and see who’s reading their stuff. So I’d like to reciprocate that as well. Boy, if WordPress was a class, it would be one of the few that I could ace without even studying. 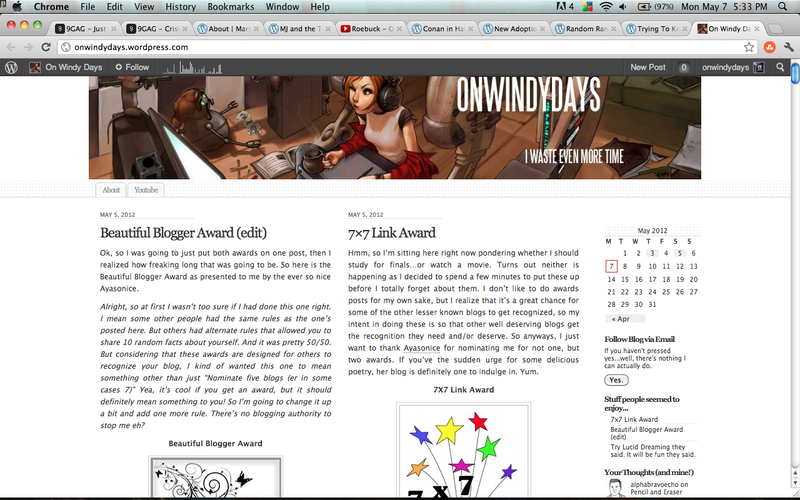 Ok, so I was going to just put both awards on one post, then I realized how freaking long that was going to be. 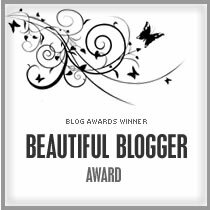 So here is the Beautiful Blogger Award as presented to me by the ever so nice Ayasonice. Alright, so at first I wasn’t too sure if I had done this one right. I mean some other people had the same rules as the one’s posted here. But others had alternate rules that allowed you to share 10 random facts about yourself. And it was pretty 50/50. 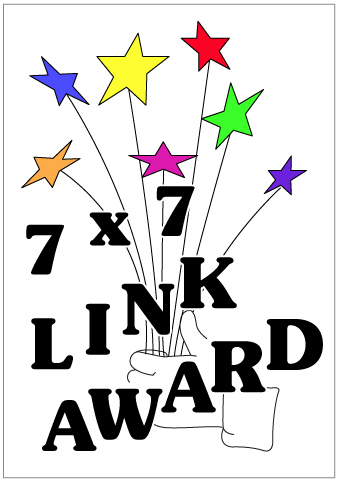 But considering that these awards are designed for others to recognize your blog, I kind of wanted this one to mean something other than just “Nominate five blogs (er in some cases 7)” Yea, it’s cool if you get an award, but it should definitely mean something to you! So I’m going to change it up a bit and add one more rule. There’s no blogging authority to stop me eh? (New Rule) Either give a paragraph of the most beautiful thing you’ve ever seen or post one picture of something you consider beautiful. Because a picture’s worth a thousand words. Copy and paste the award image on your site. 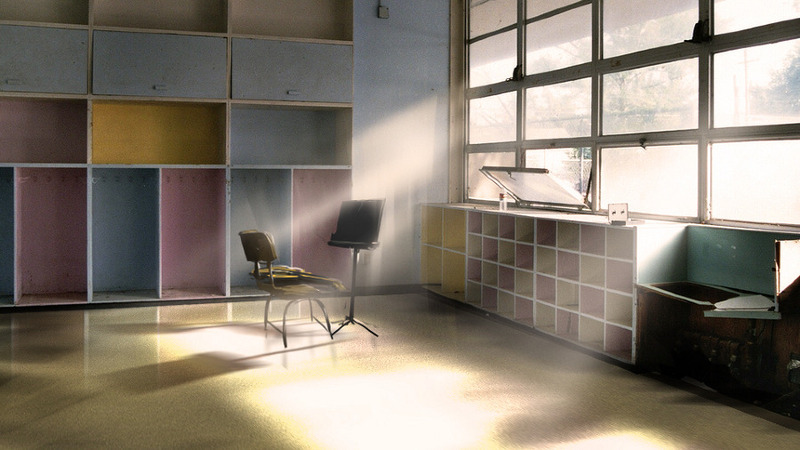 My elementary school classroom looked a lot like this. Definitely brings back the memories. I would consider this to be beautiful. So thanks once again Ayasonice, it’s always a pleasure stopping by. Now you just got to stop posting for this next week so that I don’t get distracted from studying!! Hmm, so I’m sitting here right now pondering whether I should study for finals…or watch a movie. Turns out neither is happening as I decided to spend a few minutes to put these up before I totally forget about them. I don’t like to do awards posts for my own sake, but I realize that it’s a great chance for some of the other lesser known blogs to get recognized, so my intent in doing these is so that other well deserving blogs get the recognition they need and/or deserve. So anyways, I just want to thank Ayasonice for nominating me for not one, but two awards. If you’ve the sudden urge for some delicious poetry, her blog is definitely one to indulge in. Yum. The only requirements of this award is..as below. Tell one unknown thing about me. Link to seven of my previous posts. So first off, thanks a ton Ayasonice! Going to totally be honest…I wasn’t a huge fan of poetry, at all in high school. But after reading some of the stuff that you put up, I guess you could say there’s been maybe a change of heart haha! So yea, thanks for that and keep up the great posts too! Hmm, one unknown thing about me…Born in Germany, raised in South Korea (for the first 6 years of my life anyway :P ). I’m half-Korean, half-Puerto Rican. 100% Awesome. <—haha, jk. Links to seven of my posts eh? 2. A bit about who I live with LOL. 4. Some nightmares I’ve had. 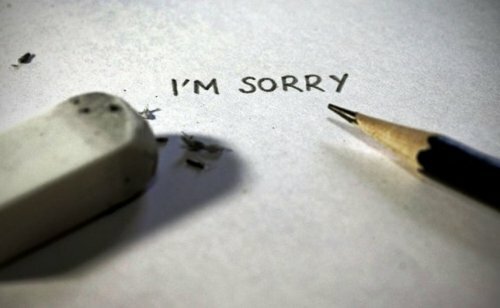 I hope you enjoy those, if you take a minute to look through them. These were some of my all time favorite posts that I’ve done, I think anyways haha. I found this story a little bit back and it was definitely a shot to the chest. I’ve never really thought of it this way.